Place platter on a trivet in a steamer, making sure water is boiling. Cover and steam for 15 minutes. Test with fork. Fish should be removed before it has a chance to become overdone. 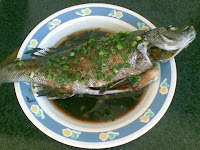 Garnish silver perch with the shredded green onion and serve steaming hot with fried or steamed rice.